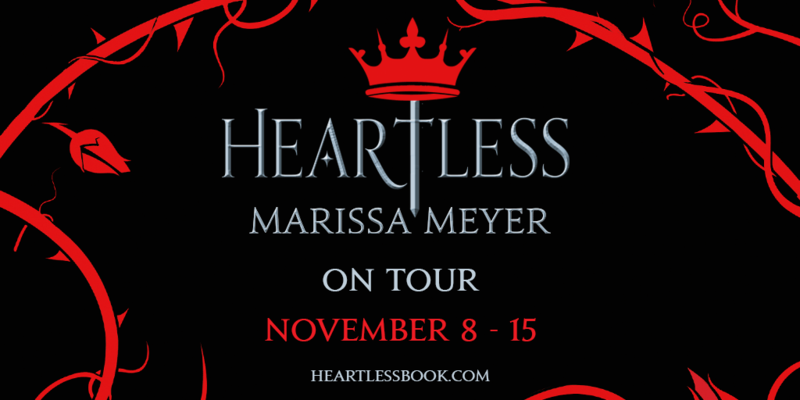 Join us for a Queen of Hearts Ball with bestselling author Marissa Meyer, in celebration of her new book Heartless. Friday, November 11; author presentation at 6 pm. Doors open - and entertainment starts - at 5 pm. General admission. This event requires a ticket, and space is limited. Embassy Suites Saratoga Springs, 86 Congress Street. You may park in the Congress Plaza parking lot, or in the Embassy Suites lot behind the hotel. Long before she was the terror of Wonderland―the infamous Queen of Hearts―she was just a girl who wanted to fall in love. Long before she was the terror of Wonderland, she was just a girl who wanted to fall in love. Catherine may be one of the most desired girls in Wonderland, and a favorite of the unmarried King of Hearts, but her interests lie elsewhere. A talented baker, all she wants is to open a shop with her best friend. But according to her mother, such a goal is unthinkable for the young woman who could be the next queen. Then Cath meets Jest, the handsome and mysterious court joker. For the first time, she feels the pull of true attraction. At the risk of offending the king and infuriating her parents, she and Jest enter into an intense, secret courtship. Cath is determined to define her own destiny and fall in love on her terms. But in a land thriving with magic, madness, and monsters, fate has other plans. In her first stand-alone teen novel, the New York Times-bestselling author dazzles us with a prequel to Alice's Adventures in Wonderland. TICKET INFORMATION: Ticket purchases may be made in-store at Norhtshire Bookstore's Saratoga Springs location and by phone at 518-682-4200 until 2 pm on Friday, November 11. Tickets will be available at the door of the event starting at 5 pm on November 11. $28: 1 seat / 1 book: Admission for one to the event, plus one hardcover copy of Heartless. $40: Bring a friend! 2 seats / 1 book: Admission for two to the event, plus one hardcover copy of Heartless. $48: Family pack! 3 seats / 1 book: Admission for three to the event, plus one hardcover copy of Heartless. If you ordered tickets on line, PLEASE READ CAREFULLY: Your invoice is your ticket. Your invoice was be e-mailed to you within 24 hours of your purchase. Please print it out and bring with you to the event. If you did not receive an invoice, please check your spam folder. If you still cannot locate the invoice, contact Liz Barnum at lbarnum@northshire.com or 800.437.3700. Marissa Meyer will personalize one book per person, and will sign (signature only) unlimited additional books. Photographs are permitted, but there will be no pauses for posed photography.